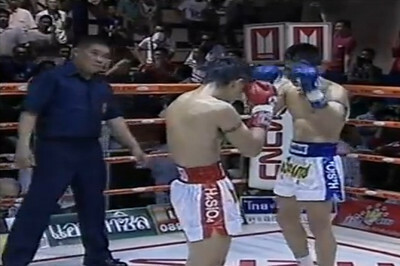 Naka Kaewsamrit (red trunks) takes on Nutaphol Kiataworn (blue trunks) at 127lbs. This fight is from Omnoi Stadium, Bangkok on the 20th October 2012. Much thanks goes to Live Muay Thai Guy for sharing this clip! ~ by fatsoking on October 22, 2012.